And why their efforts may make their wishes a reality. Tesla short sellers believe the lots full of new Model 3s and Models S and X vehicles, too show Tesla has reached a cliff in demand for its vehicles. When the rest of the world admits the company’s days as a fast-growth story are numbered, its stock price will crash, creating a bonanza for investors who have bet big that Tesla’s shares are grossly overvalued. Tesla is heavily shorted: Of its shares, 17% are held by short sellers (via) a crowd-sourced stock research platform. It’s a sunny day in March and “Machine Planet” is flying a single-engine Cessna over Northern California. He’s cruising at 1,500 feet toward a massive lot leased by electric-car maker Tesla. His mission: to burst the Tesla bubble. And make some money doing it. What he sees today makes his eyes widen: more than 100 car-carrier trailers, the kind you see on highways hauling new cars to dealers. They’re lined up in neat rows. Empty. Idle. If you spend any time on the Twitter hashtag $TslaQ, you know what this means to Tesla short sellers. They believe the lots full of new Model 3s — and Models S and X vehicles, too — show Tesla has reached a cliff in demand for its vehicles. When the rest of the world finally admits the company’s days as a fast-growth story are numbered, they say, its stock price will crash, creating a bonanza for investors who, like Machine Planet, have bet big that Tesla’s shares are grossly overvalued. The pilot banks his plane hard to the left and starts snapping pictures with a Canon 6D. For as long as there have been stock markets, there have been short sellers wagering that companies will fail. Their notoriety stemmed from their dirt-digging tactics. Napoleon supposedly called them “enemies of the state.” Some blamed them for the stock market crash of 1929. Short seller Jim Chanos took a position against Enron and won when the company was revealed to be an accounting fraud. Bill Ackman claimed Herbalife was a pyramid scheme; he slunk away after five years, the company still intact. But the war on Tesla is unique. Musk has used Twitter to cultivate a cult-like following as a tech revolutionary. Fittingly, his nemesis is a social media swarm, made up largely of anonymous contributors with made-up names and colorful avatars. Machine Planet belongs to a large and growing network of Tesla skeptics who connect on Twitter through $TslaQ — Tesla’s stock symbol, followed by Q, a stock exchange notation for a company in bankruptcy. Which Tesla, to be clear, is not. What Tesla is, relatively speaking, is heavily shorted: Of its 173 million shares, about 17% are held by short sellers. Pronounced Tesla-Q, the channel has emerged as a crowd-sourced stock research platform. Contributors divide up research duties according to personal interest and ability, with no one in charge. Some use commercial databases to track Tesla-loaded ships from San Francisco to Europe and China. Some are experts at automotive leasing or convertible bonds. Some repost customer complaints about Tesla quality and service. One contributor, whose Twitter handle is TeslaCharts, assembles collected data to offer graphical representations of Tesla’s own reports and $TslaQ’s findings. And some do reconnaissance, posting photos and videos of Tesla storage lots, distribution centers, even the company’s Fremont assembly plant as seen from above. A major aim is to change the mind of Tesla stock bulls and the media. The research helps individual short sellers decide when to move in and out of the stock. But it’s clear from the posts that $TslaQ can be just as vitriolic as Tesla fans are adoring. “I go out of my way to listen to them because I want to hear the worst things people can come up with about stocks I have a position in,” said Ross Gerber, head of Santa Monica portfolio management firm Gerber Kawasaki, who is impressed by much of $TslaQ’s research. But he’s been subject to personal attacks from some $TslaQ members, and said too much emotion from the short sellers can degrade some of the solid research they offer up. Although activist investors have been around for years, the networked nature of this research and publicity campaign is new, said Byoung-Hyoun Hwang, a Cornell University finance professor who’s studied social media’s effect on financial markets. “The diversity of perspectives, not just a diversity of opinions, could be very valuable,” he said. Most $TslaQ posters try to remain nameless, citing the repercussions faced by some Tesla critics, including death threats to some $TslaQ members and harassment by Musk himself. On a Hawthorne sidewalk not far from another Musk company, SpaceX, a man raises his iPhone to get a good camera angle. It’s after dark. Model 3s by the hundreds are parked inside a lighted-up three-level parking garage. The cars are covered in dust. According to the man, some have been in there for months. The man says he works for a short seller who goes by the Twitter handle Latrilife. In return for scouting out and monitoring Tesla delivery centers and storage sites around L.A., he gets $20 an hour. Such storage practices are “extremely unusual” in the auto industry, said Bill Hampton, a Detroit veteran who runs AutoBeat Daily, an online industry newsletter. Tesla doesn’t have traditional dealers, whose lots are filled with Fords, Chevys and Hondas awaiting buyers. That could account for some of Tesla’s scattered inventory, he said. Tesla declined to discuss the cars in the Hawthorne lot. $TslaQ has no leader, but it does have a hero. His name is Lawrence Fossi, a lawyer and New York money manager who contributed to the Twitter hashtag as well as investor site Seeking Alpha under the moniker Montana Skeptic — until he was exposed by Musk. Meanwhile, Tesla’s public relations department sent emails to the media naming Fossi and encouraging reporters to call his boss — phone number included. The communications executive involved declined to discuss that matter. Fossi said he didn’t take the lawsuit threat seriously, “but I couldn’t afford to drag my boss into this.” So he quit writing for Seeking Alpha and deactivated his Twitter account. Musk declined to be interviewed for this story. But the $TslaQ phenomenon clearly vexes him. He calls Twitter a “war zone” and regularly attacks short sellers. His taunts sometimes produce a stock price boost. Starting last May, Musk amped up his battle with the shorts, promising “the short burn of the century” on Twitter. On July 23, four days after Machine Planet posted photos of hundreds of cars parked at a facility outside Stockton, Musk phoned Montana Skeptic’s boss. And on Aug. 7, Musk issued his infamous “420” tweet, in which he claimed he had “funding secured” to take Tesla private at a premium price — $420 a share. Some short sellers got burned as the stock price immediately rose by nearly 13%. But so did bull investors who thought the deal was real. It wasn’t, and by Aug. 20, as reality sank in, Tesla shares were down almost $100 a share, or 25% from pre-tweet levels. The episode landed Musk in deep trouble with the U.S. Securities and Exchange Commission. Musk settled fraud charges in September, but the SEC has since asked a federal judge to hold him in contempt of court, saying he violated terms of the agreement with subsequent tweets. Last Thursday, the judge told the SEC and Musk to work out a remedy. The short thesis gained traction last week when Tesla announced a dramatic drop in deliveries in the year’s first quarter — Model 3 deliveries fell 19% from the previous quarter, and older Models S and X models tumbled 56%. “The fundamental narrative around Tesla appears more clouded than we have seen in several years,” Morgan Stanley stock analyst and Tesla bull Adam Jonas wrote well before the numbers were released, in a March 20 investment note. Tesla bull Gerber says the numbers were “a bit light” but sees great things ahead for the company. Tesla insists that U.S. orders for the Model 3 are strong, and that the company simply couldn’t deliver all ordered vehicles in the first quarter. And it says, even with the sharply lower deliveries, the Model 3 was the top-selling midsize luxury sedan. Tesla’s stock closed at $274.96 on Friday, down from an all-time high of $385 in September 2017. Wall Street sentiment on the company has chilled. Several Wall Street analysts have lowered their stock price targets in recent weeks. Citing the case of Fossi, several $TslaQ contributors agreed to talk only if they could remain anonymous. Huettner didn’t believe Musk was involved, but he found the message frightening and reported it to the FBI. Machine Planet is 60 years old, tall and trim. The semiretired marketing executive worked at several well-known Silicon Valley companies. Now he’s a contract consultant, an avid pilot and an investor with an eye for overvalued stocks. He scored well, he said, with big short bets against Bear Stearns and Lehman Bros. in the early days of the Great Recession. Tesla first attracted Machine Planet’s attention about three years ago, he said, because it seemed as much a cult as a company. In April 2018, laid up after surgery, he listened to a lively conversation about the short case on the irreverent financial markets podcast Quoth the Raven. But he noticed car-buyer demand was a big topic on $TslaQ. Contributors posted Google satellite shots of lots in remote locations, far from the company’s Fremont factory, where cars were being stored. One spot was in Lathrop, not far from Stockton, in an unirrigated section of the Central Valley known as the “dust bowl.” A couple of $TslaQ contributors had spotted an ad for Tesla jobs there. They found what seemed like hundreds or thousands of Model 3s being trucked into a lot through a gate and behind fences. But they couldn’t get a good look inside. “So I flew to Lathrop,” Machine Planet said. “There was this amazing moment when I realized the entire facility was packed with cars.” More than 3,000, he said. “Shorty Air Force,” he said. He’d made the name up on the spot. By the time he’d landed, $TslaQ contributor Zach Hanover had designed a Shorty Air Force shoulder patch logo based on a World War II design. The flyover nudged others into action. 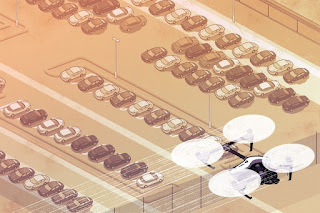 Latrilife, who says he has “six figures” invested in short bets that Tesla’s stock price will plummet, hired a helicopter to photograph the Hawthorne garage’s top level, the view of which was inaccessible from the public sidewalk. “We don’t trespass,” Latrilife noted. One man started sending a drone over automobile auction houses, posting videos of Teslas stored there. A loosely formed Shorty Ground Force began posting pictures of Teslas stored for weeks on lots across the country. Crow Point Partners, an investment firm with a short position in Tesla, periodically posted pictures of Model 3s parked in Norwood, Mass., covered in deep snow. The snow recently melted, but most of the cars are still there, the firm contends. Just last Tuesday, a $TslaQ contributor posted a video that appeared to show dozens of Teslas parked on the fifth floor of a shopping mall parking garage in Buena Park. In an age of social media Photoshop fakes, it pays to be leery about anything that appears on Twitter or elsewhere online. So The Times flew with Machine Planet and spent a day in Los Angeles with Latrilife and the man he hired to take photos. A reporter roamed a public parking lot outside the Crunch Gym in Burbank, where more than 100 Teslas sat. The vehicle identification numbers showed that many were manufactured in 2018. 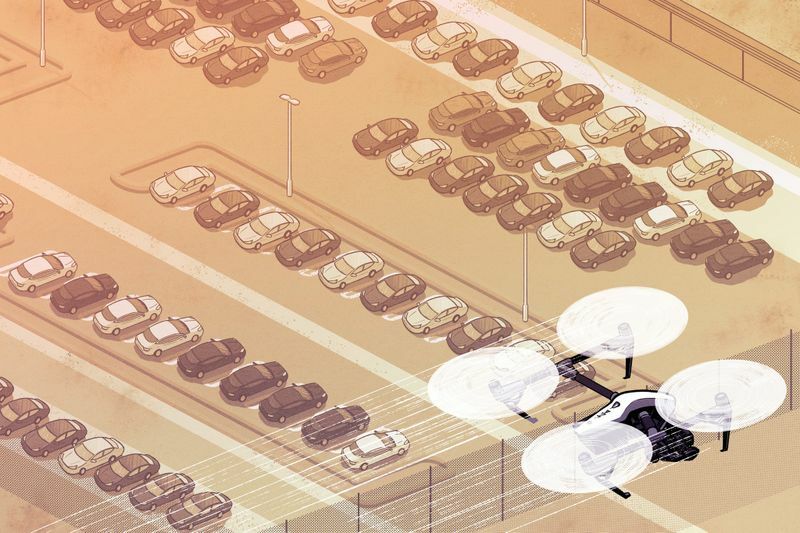 He backs up his assertion with data from IHS Markit, a market research firm, as reported recently in the New York Times: Tesla said it delivered 245,000 cars in 2018. Most were in the United States. But IHS said only 164,000 were registered nationwide. His 2017 assurance to Wall Street analysts that they should have “zero doubt” Tesla would hit a production level of 10,000 cars a week by the end of 2018. The company has yet to achieve a steady rate of half that number. Or his 2016 solar tile demonstration, a product that was supposed to revolutionize the residential solar market by embedding solar panels into the roof itself. But the tile he held in his hands turned out to be a nonfunctional mock-up, and more than two years later, the technology isn’t ready for commercial distribution, though Tesla continues to take deposits from customers. Machine Planet says his interest in Musk is both pecuniary and personal.